Image: Neutrophils inside lung adenocarcinoma tumors. On the left, neutrophils inside a mouse tumor are stained brown; on the right, neutrophils inside a human tumor are stained red (credit: E. Meylan/EPFL). EPFL scientists have discovered that neutrophils, a type of immune cell, can actually help lung tumors grow. The work is published in Cell Reports, and has enormous implications for cancer immunotherapy. Lung cancer is the leading cause of cancer-associated deaths. One of the most promising ways to treat it is by immunotherapy, a strategy that turns the patient’s immune system against the tumor. In the past few years, immunotherapies have been largely based on the degree by which immune cells can infiltrate a tumor, which has become a major predictor of the patient’s overall prognosis. The problem is that lung tumors adapt to the attacks and find ways to evade them. One of these ways involves a protein called “Programmed death-ligand 1 (PDL1)”, which the tumor cells express on their surface. When immune cells, e.g. T cells, attack the tumor, PDL1 binds a protein on their own surface appropriately named “programmed cell death protein 1”, or PD-1). This interaction triggers an entire cascade of biological reactions in the immune cells that shuts down their attack machinery and renders them harmless to the tumor. To deal with this, immunotherapeutic regimens often involve drugs that block PD-1, so as to cut off the tumor-evading mechanism. But, unfortunately, this has not been enough. What we need is a fuller understanding of the immune circuits that are active in lung cancer; a knowledge that would allow us to optimize and increase the efficiency of current immunotherapies. 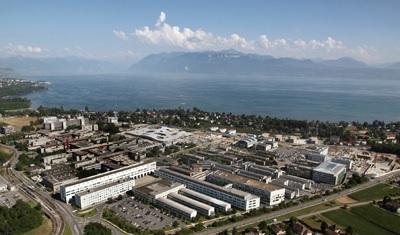 To do this, the lab of Etienne Meylan at EPFL used a mouse model of lung cancer to establish what we call an “immune signature” in lung cancer. The study shows that lung tumors can actually be helped by neutrophils – a type of immune cells that are normally at the first line of attack in infections, allergic reactions, and asthma. In short, neutrophils contribute to disease progression rather than stop it. The scientists carried out what is known as “neutrophil depletion”, which is a method for studying what happens in a tumor when neutrophil numbers are reduced. By depleting neutrophils in the mice, the researchers were able to deduce what effects they have on a lung tumor when they are actually present. Surprisingly, depleting neutrophils caused a profound re-modeling of the immune compartment of the lung tumor, with T cells flooding it. This means that neutrophils actually help the tumor hide better from T cells – this is referred to as “immune exclusion”. On the contrary, neutrophil depletion sensitized tumors to anti-PD1 immunotherapies. The data also showed that the presence of neutrophils leads to changes in the function of the tumor’s blood vessels. The changes trigger hypoxia and cause the tumor cells to produce a protein called “Snail”. This is important because Snail is widely known to help cancer cells resist drugs, as well as promote tumor recurrence and metastasis. The researchers found that Snail in turn increased the secretion of the protein Cxcl2, augmenting neutrophil infiltration. This creates a positive loop that accelerates the progression of the cancer. In short, the study shows that neutrophils promote tumor progression and can actually hamper the work of immunotherapy in lung cancer. 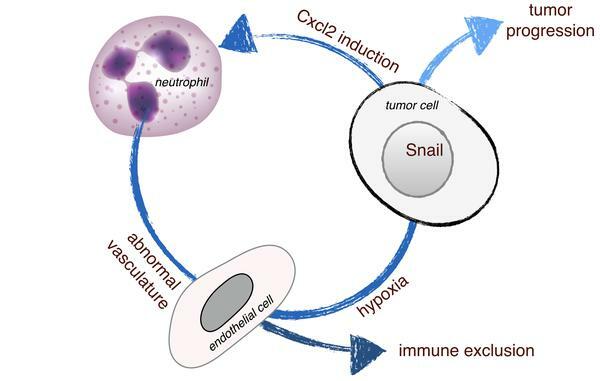 The authors describe this as a “vicious cycle” between neutrophils and Snail that ultimately maintains a tumor microenvironment supporting tumor growth.